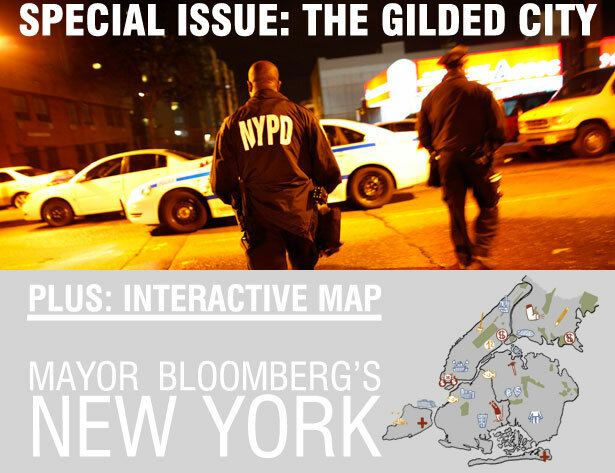 From Wall Street to Brownsville, inside Bloomberg's New York. After nearly twelve years in office, Mayor Michael Bloomberg has proved himself a powerful force, and has become at once a symbol and a source of many of the city’s changes. From his perch at City Hall, and with the aid of both imperial wealth and an often imperious personality, he has pushed a vision of the city that has charmed the chattering classes and confounded critics, even as it has defied easy categorization. Amid the two-tier urbanism of the Bloomberg era, many people have been working hard to make the city a more equal place. Workers have been coming together at fast-food restaurants, retail stores and car washes. Liberal-minded politicians, calling themselves the Progressive Caucus, have brought innovative ideas to the City Council. A coalition of the stopped-and-frisked has pressed for big changes in policing policy. New York is a city forever giving birth to itself. It is no accident that Occupy Wall Street was born here. And in November, when New Yorkers go to the polls to elect a new mayor for the first time in twelve years, the city will reinvent itself yet again. “People aren’t good at describing what is in their own interest,” Bloomberg has said, to explain why he described it for them. Now the people will have a chance to define for themselves what kind of New York they want to live in: a Gilded City, or a genuinely democratic one. What Happened to Working-Class New York?